Thoughts on mobile and social technologies connecting enterprises and consumers - from the perspective of a consumer and a software product manager. Customers are retaliating by fleeing to social media channels. It's easy and convenient and Social CRM/ Social Customer Service tools have been getting more sophisticated (e.g., SAP Social OnDemand). However customers might be embracing social media due to the failure of normal channels. Frustrated customers realize the only way to get service might be to subtly 'threaten' the brands with public humiliation (or the marketer's worst nightmare - a PR fiasco!) Personally, I would rather have my problem resolved privately, than having to complain publicly and I suspect many would feel that way. Social Media is primarily designed for person-to-person interactions. People don’t typically think of social media as a channel to engage with companies. 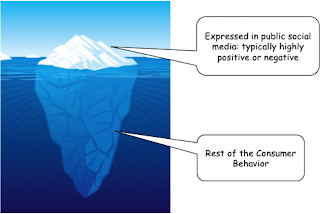 Even when they do, the vast majority of interactions on public social media (observable by brands) is driven either by highly positive experiences or highly negative experiences. • What is the right product for me and my family (lifestyle preferences or restrictions)? • What do other people (friends & experts) think about it? • How do I fix a problem? • How do I get personally relevant information (e.g., product updates/ recalls), when I want it, instead of being spammed? For brands, engaging with the consumers after-purchase to drive loyalty and repeat purchases is often more profitable than expensive acquisition of fickle consumers (a la Groupon). Customer service is not usually the best place to start an interaction, but if handled well, it could be a strategic tool to increase loyalty and brand advocacy. You might even agree with the (provocative) statement ‘Customer Service is the New Marketing’. Some early adopter retailers are beginning to do this (beyond coupons & deals). It may be even more important for consumer products manufacturers that are disintermediated from the end-consumers. Mobile gives them a direct engagement channel - not just to reduce costs by self-service, but to know who their consumers are (which many don't know, as few customers register) and get insights on how they use the product. Mobile does introduce many challenges. There are only very few successful examples of engaging brand mobile apps (such as Nike+) with high customer adoption. It might be partly because of the app fatigue ('download yet another app!') and probably because of the pushy sales approach without offering much value to the consumers (the same reason why many brand Facebook pages struggle). Today, Most of us are happy (or at least, got used to!) going to our computer and Google (or Facebook) for any customer service issue. However, just like any digital consumer interaction, I believe customer service is moving to mobile too, if it's designed well to deliver value to both the consumers and enterprises. I am interested to hear what you think. So, the less automated call distributor is what it means with mobile customer service? I still doubt if customer service is in its pitfalls already, many would still want to hear the cue of "Thank you for calling *insert company here*, how may I help you?". Thank you for taking the time to comment. 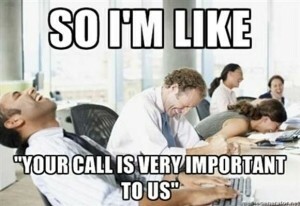 My observation was that people don't want to call customer service and be put on hold. Most Google for answers and some go to social media. The next generation seems to prefer texting and typing than speaking on the phone with anyone, let alone customer service agents! I'm all for customer service. However, I guess it's more important if they act on it besides giving only the sugarcoated words without fixing anything. Thank you for the comment. Completely agree! As more customers switch to web and social media to help themselves, it'll be interesting whether mobile could be a channel for us, without having to wait for the customer service rep, who often cannot fix the problem. 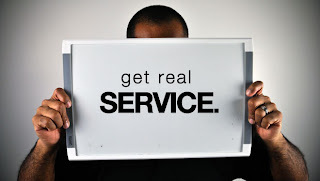 Putting up a customer service department takes a lot of effort to make things work properly. The electronics and machines needed should be installed properly to satisfy the customers' want and need. I agree with Luis. Having a customer service department, for me, is very helpful. Most especially for the people wanting to know the things they have to do in business registration. I experienced the same thing in India. Actually, anyone can do great in this type of job. They just have to speak in a monotone voice so that every customer can understand the agent clearly. Chromebook, Surface Tablet, or iPad?